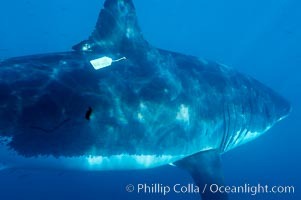 A great white shark bearing a white plastic researcher's identification ID tag near its dorsal fin swims through the clear waters of Isla Guadalupe, far offshore of the Pacific Coast of Baja California. Guadalupe Island is host to a concentration of large great white sharks, which visit the island to feed on pinnipeds and tuna. Identification Tag Photo. Brown pelican, juvenile with blue and gray identification bands on its legs. This large seabird has a wingspan over 7 feet wide. 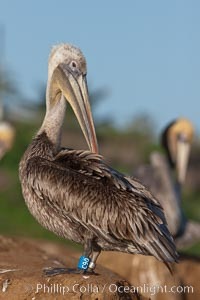 The California race of the brown pelican holds endangered species status, due largely to predation in the early 1900s and to decades of poor reproduction caused by DDT poisoning Identification Tag Picture. Brown pelican, juvenile with blue and gray identification bands on its legs. This large seabird has a wingspan over 7 feet wide. 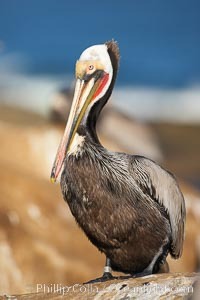 The California race of the brown pelican holds endangered species status, due largely to predation in the early 1900s and to decades of poor reproduction caused by DDT poisoning Stock Photography of Identification Tag. 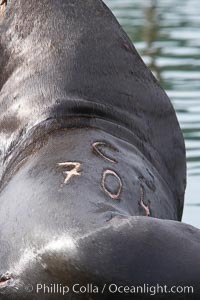 A bull sea lion shows a brand burned into its hide by the Oregon Department of Fish and Wildlife, to monitor it from season to season as it travels between California, Oregon and Washington. Some California sea lions, such as this one C-704, prey upon migrating salmon that gather in the downstream waters and fish ladders of Bonneville Dam on the Columbia River. The "C" in its brand denotes Columbia River. These sea lions also form bachelor colonies that haul out on public docks in Astoria's East Mooring Basin and elsewhere, where they can damage or even sink docks. Photograph of Identification Tag. 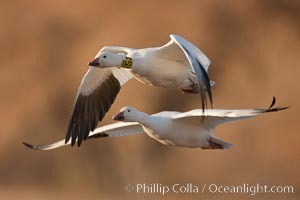 Snow goose bearing neck and leg research ID tags, in flight. Identification Tag Photos. 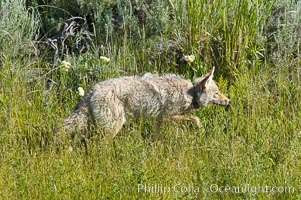 Coyote, Lamar Valley. This coyote bears not only a radio tracking collar, so researchers can follow its daily movements, but also a small green tag on its left ear. Identification Tag Image. 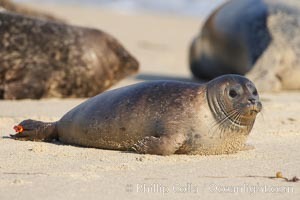 Pacific harbor seal, juvenile, with research identification tag on hind flipper. Childrens Pool. Professional stock photos of Identification Tag. 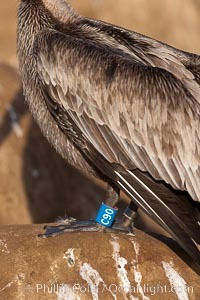 California brown pelican wearing identification tag, winter mating plumage. Pictures of Identification Tag. 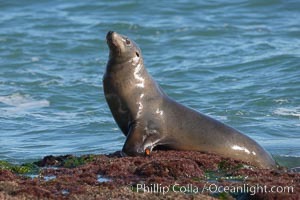 California sea lion wearing identification tag on left foreflipper. Identification Tag Photo. 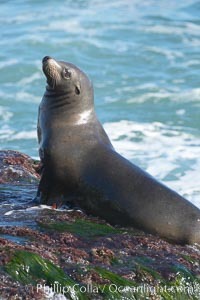 California sea lion. Identification Tag Picture. 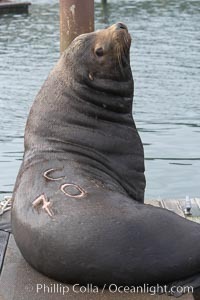 A bull sea lion shows a brand burned into its hide by the Oregon Department of Fish and Wildlife, to monitor it from season to season as it travels between California, Oregon and Washington. Some California sea lions, such as this one C-704, prey upon migrating salmon that gather in the downstream waters and fish ladders of Bonneville Dam on the Columbia River. The "C" in its brand denotes Columbia River. These sea lions also form bachelor colonies that haul out on public docks in Astoria's East Mooring Basin and elsewhere, where they can damage or even sink docks. Stock Photography of Identification Tag. 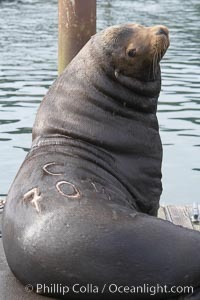 A bull sea lion shows a brand burned into its hide by the Oregon Department of Fish and Wildlife, to monitor it from season to season as it travels between California, Oregon and Washington. Some California sea lions, such as this one C-520, prey upon migrating salmon that gather in the downstream waters and fish ladders of Bonneville Dam on the Columbia River. The "C" in its brand denotes Columbia River. These sea lions also form bachelor colonies that haul out on public docks in Astoria's East Mooring Basin and elsewhere, where they can damage or even sink docks. Identification Tag Photos. 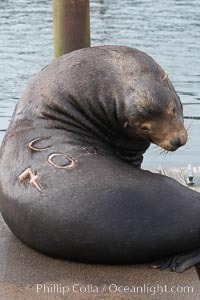 A bull sea lion shows a brand burned into its hide by the Oregon Department of Fish and Wildlife, to monitor it from season to season as it travels between California, Oregon and Washington. Some California sea lions, such as this one C-704, prey upon migrating salmon that gather in the downstream waters and fish ladders of Bonneville Dam on the Columbia River. The "C" in its brand denotes Columbia River. 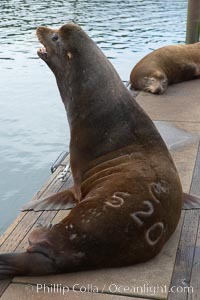 These sea lions also form bachelor colonies that haul out on public docks in Astoria's East Mooring Basin and elsewhere, where they can damage or even sink docks. Identification Tag Image. 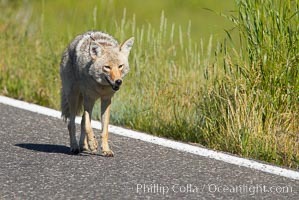 Coyote, Lamar Valley. This coyote bears not only a radio tracking collar, so researchers can follow its daily movements, but also a small green tag on its left ear. Professional stock photos of Identification Tag. 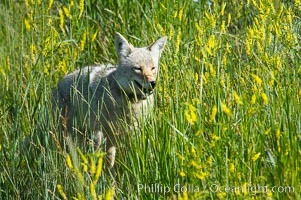 Coyote, Lamar Valley. This coyote bears not only a radio tracking collar, so researchers can follow its daily movements, but also a small green tag on its left ear. Pictures of Identification Tag. 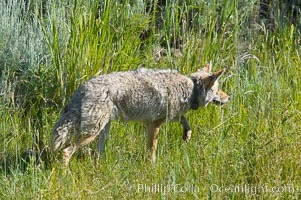 Coyote, Lamar Valley. This coyote bears not only a radio tracking collar, so researchers can follow its daily movements, but also a small green tag on its left ear. Identification Tag Photo. 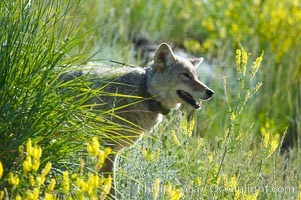 Coyote, Lamar Valley. This coyote bears not only a radio tracking collar, so researchers can follow its daily movements, but also a small green tag on its left ear. Identification Tag Picture. 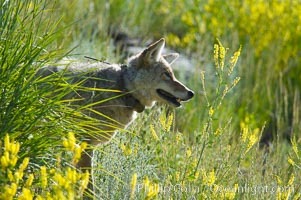 Coyote, Lamar Valley. This coyote bears not only a radio tracking collar, so researchers can follow its daily movements, but also a small green tag on its left ear. Stock Photography of Identification Tag.